When we returned from Malta, I made several efforts to replicate the boat paint. But boat paint is too pricey in the States, and so I tried house-paint. 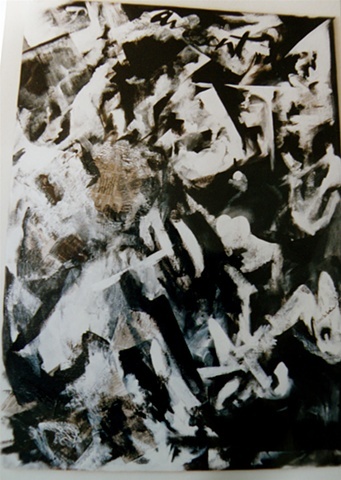 This was one of several exercises in "pure" black and white, and it was painted over newspaper, inspired, I think now, by the Cubist still-lifes of Picasso and by Pollock's early paintings like "She-Wolf" and "Totem."